In the first post we explored the idea of successfully getting through the school year by letting Scripture be our guide. More than just pointing out moral rights and wrongs, the Bible actually gives us an entire perspective by which we can view the world. In a sense, rather than looking at circumstances from your own perspective, which may sometimes be misguided, the Bible helps you look at the world through God's eyes. However, we can all admit that the Bible can be difficult to understand at times. If you haven't spent much time studying it then it might even seem altogether to intimidating. With 66 books in the Bible and thousands of pages it can be hard to figure out where to even start! 1. Get a study Bible. These are incredibly helpful with notes at the bottom of the page helping you to understand what a verse or an entire passage is saying. The first one I ever used was a Life Application Study Bible from Wal-Mart for about $25. Other good ones include the Reformation Study Bible, the ESV Study Bible, the Gospel Transformation Bible, or the MacArthur Study Bible. 2. Start with a gospel (Matthew, Mark, Luke, or John). These are written in story form and generally have an easy-to-follow flow to them. After reading an entire gospel, a good place to go is "Acts." This is the book in the New Testament that comes right after John. It's the continuation of the story from the gospels and also has a pretty easy-to-follow presentation. 3. Use a Bible reading plan. You can find about a billion different ones online so select one that best suits your time schedule and capacity to read smaller or larger chunks. I am an extremely slow reader and I get distracted easy, so plans that require 5 or 6 chapters in a day don't work for me. Maybe that's no problem for you! 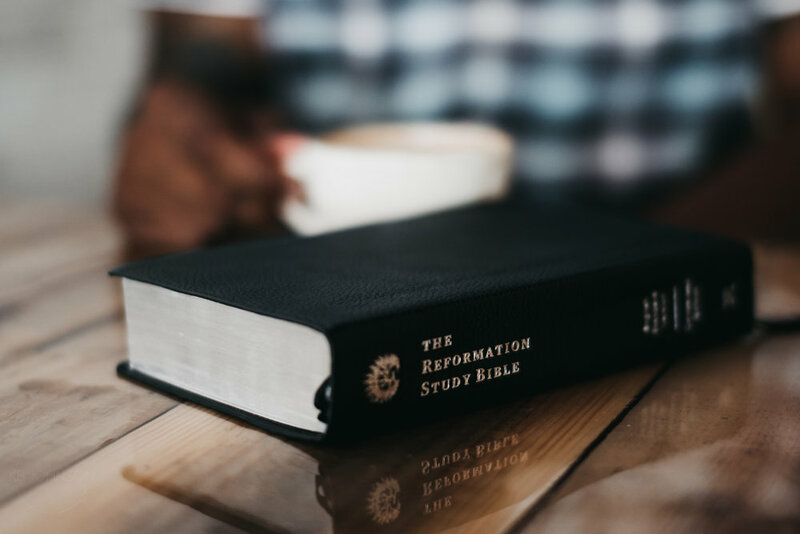 The plan I like the most is the Redemptive-Historical Bible plan that organizes passage in the order that they play out over the course of biblical and human history. You can find that plan here. 4. Read things over and over again. Don't be afraid to continuously go back and read something you've already read. We do this with movies, TV shows, and novels all the time. I've seen the Bourne movies over 30 times easily and I can say the same about a lot of other movies, too. I can also honestly say that even in having taught the Bible for the last 12 years of my life I still learn new things from passages that I have seen many times. One of the best ways to get something to sink in is repetition. This is how we lift weights; this is how we learn in school. Repetition is a good thing and it will help you understand your Bible better. So keep reading! 5. Read with a friend. Proverbs 27:17 says, "Just as iron sharpens iron, so one man sharpens another." The same is true of your spiritual growth. Find a friend who is willing to sit down with you and go over the same passage. You can read together at a coffee shop, at each other's house, or read separately, take notes, and then talk over the phone about what you read. You might be surprised by the insight God gives to your friend that you weren't seeing when you read, and vice versa! 6. PRAY. Pray a lot. This is more of a rule than a suggestion. Bible reading won't work without it. Pray before reading and pray after. Pray that God would help you understand what you are reading. Pray that he would help you to focus. Pray that the Holy Spirit would commit what you read to your memory so that you can recall it in times when you need it the most. The Bible is a divine book which makes it unlike any other. It is impossible to grasp the spiritual things of the Bible without God's help (1 Corinthians 2:14-15), so lean on him in prayer to get the assistance you need. 7. DO. One of the most underrated aspects of Bible reading is DOING WHAT IT SAYS. Birds don't learn to fly by talking about flying and studying the physics of it. At some point Mama Bird has to push her babies out of the nest. We learn a lot by applying the principles we are attempting to grasp. If you read a passage about forgiving one another, then go and find that person you need to forgive and do it. You will experience a little of the goodness that God gives and you will remember what you read a whole lot better because you experienced it. 8. Forgive yourself. One of the hardest things for people to do in an age of such distraction is sit down and really commit to consistent Bible reading. Things will come up and you will miss days. You'll forget to read your Bible or you will do something sinful and feel too guilty to pick it up. Rest assured, God knows who you are and he knows what you've done. Hiding and avoiding quality time with him won't change that. But if you have a relationship with him, meaning you believe that Jesus Christ is your only way to be saved and forgiven, then the reality is that you ARE saved and forgiven. Therefore you can read your Bible with the freedom of God is for you and he loves you. If he already punished Jesus on the cross on your behalf, then he isn't holding the last 10 days, 10 weeks, or 10 years of Bible reading against you. The best thing to do is start now! Newer PostThese Dudes and my Heavenly Father.